ABB high performance drives are designed for industrial applications in process industries such as the pulp & paper, metals, mining, cement, power, chemical, and oil and gas industries. These drives are highly flexible AC drives that can be configured to meet the precise needs of industrial applications, and hence order-based configuration is an integral part of the offering. A wide range of ratings and voltages, including industrial voltages up to 690V, are typical. 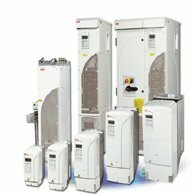 ABB high performance drives come with a wide range of built-in options and provide application specific software to which make it able support an extensive range of application requirements. The ACS800 family of AC drives offers a wide range of products with common technologies. This includes Start-up Assistant, Adaptive Programming and DTC- Direct Torque Control, common user and process interfaces, software tools for sizing, commissioning and maintenance with common spare parts. The heart of the ACS800 is DTC, ABB's premier motor control technology. The consistently excellent performance of the ACS800 assures that this drive will not be limiting factor in your process.